GanttDiva is a free, fully customizable, Excel based Project scheduling software with an easy to learn interface to simplify the task of creation and maintenance of a project schedule. 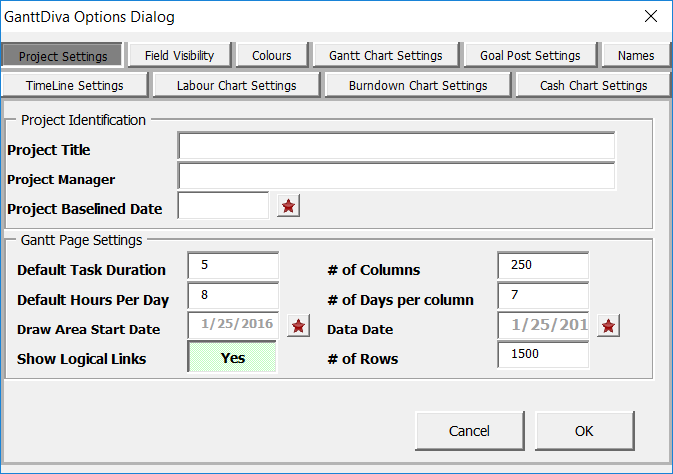 GanttDiva is more than just a Gantt chart template. You can not only create a gantt chart in Excel using GanttDiva – it is also simple to create a full project plan (several sample project plans are included) and using its built in analytics, it is easy to update and monitor project progress. You also have all the capability of Excel including the ability to enter formulas, comments and formatting information into almost all GanttDiva fields. GanttDiva is very easy to configure using its Options Dialog, and can support projects with up to 3000 activities. Use it to create schedules and track progress for your company, small team, renovation projects or for any project that you can think of. GanttDiva calculates your resource needs based on your latest status updates and its autofiltering support lets you easily drill down in to your project. Check out the list of sample projects that describes some templates that you can use to build up your own schedule. These templates are included in the GanttDiva installation package. A full featured version of GanttDiva is also available and is one of the most affordable, fully featured, Excel based scheduling programs you can find (only 29$). A user configurable calendar that allows a user to customize workdays, weekends and holidays. GanttDiva determines bases task durations and start and finish dates on workdays as per this calendar definition. Check out the full list of features for more information.